Airports are going green in response to increasing pressure regarding the aviation industry’s environmental impact. Airport Technology recently spotlighted the world’s most environmentally friendly airports and highlighted what elements of those facilities’ design help them to offset carbon emissions. The aviation sector is facing increasing pressure to clean up its act when it comes to climate change, but gas-guzzling airplanes aren’t the only culprits. As airports expand, so too does their carbon footprint, with more energy required to power new terminals, ground transport vehicles and the creation of infrastructure. Many airports have adopted greener elements into their designs and operation strategies, as well as subscribed to eco-friendly initiatives. The Airport Carbon Accreditation program run by Airports Council International (ACI) is helping more than 200 airports to manage emissions, with the ultimate goal of carbon neutrality. Boston Logan features the world’s first air terminal to win a Leadership in Energy and Environmental Design accreditation. Its Terminal A features roofing and pavement surfaces designed to reflect heat from the building, as well as low-flow bathroom fixtures to save water. The Massachusetts Port Authority (Massport) invested $6.3 million into repaving one of the airport’s runways with environmentally friendly asphalt, which could be heated at a significantly lower temperature during construction. A fleet of 6-foot-tall wind turbines are installed on top of the airport’s offices, generating around 3 percent of the energy required for its operations. The potentially damaging impact of tourism has been a constant concern for the Galápagos Islands, making it an apt location for the world’s first entirely “green” airport. Built in 2012, Galapagos Ecological Airport was designed to run completely on solar and wind power, with 65 percent of total energy supplied by windmills and 35 percent coming from photovoltaic panels fitted on walkways. Eighty percent of Galápagos’ infrastructure was created using recycled materials, including steel pipes taken from oil extraction fields in the Ecaudorian Amazon. Wood and metal structures from its ancestral hub, Seymour Airport, were reused, while furniture was produced from environmentally friendly sources. Last year, Norway’s Oslo Airport launched a 377,296-square-foot expansion to its terminal, with energy efficiency cited as a key part of its design. Recycled and natural materials embody the Oslo terminal expansion. The extension was built with reused steel and environmentally friendly concrete mixed with volcanic ash, before being clad in timber sourced from Scandinavian forests. Snow is taken from Oslo’s runways and stored in an onsite depot for use as a coolant in summer. This aspect won the airport an “excellent” sustainability rating under the Building Research Establishment Environmental Assessment Method standard. The first European airport to achieve carbon neutrality in 2009, Stockholm Arlanda Airport is the only airport in the world whose environmental permit features a cap on its carbon dioxide emissions. To save electricity, Stockholm makes use of a biofuel system to heat its terminals, hangar and airfield buildings. Water is collected by a series of wells linked to an underground aquifer, before being sent to the terminal’s air conditioning system during summer, and to a biofuel-powered heating system in winter. The method is also used to head pads of cement near the airport’s hangars, keeping doors and ramps clear of ice. Through the implementation of low-power LED lighting and a number of other measures, Stockholm was able to cut its energy use by almost a third in the period from 2005-12. Singapore’s Changi Airport two most recent terminal additions are designed to highlight the airport’s commitment to green principles, with skylights to boost natural light, air conditioners positioned nearer to the floor and an abundance of greenery. The recently opened Terminal 4 features a green wall bedecked with more than 20,000 plant species, which is said to reduce the airport’s surrounding temperature and improve air quality. Other features deployed at Changi include energy-efficient motion sensors and lighting, water-efficient fittings, and roof-mounted solar panels. Zurich Airport has reduced its carbon emissions by approximately 30 percent since 1991 and aims to reduce this even further by 2030. Photovoltaic systems are fitted on the roofs of aircraft docks and car parks, while underground energy piles are used to heat and cool its terminals. Water consumption at the airport has also decreased, with domestic wastewater being channeled to an offsite treatment plant, and rain being collected for use in toilets. Water from de-icing operations is also recycled via a unique natural process, during which specialized micro-organisms are deployed to break down solid residues in the liquid. 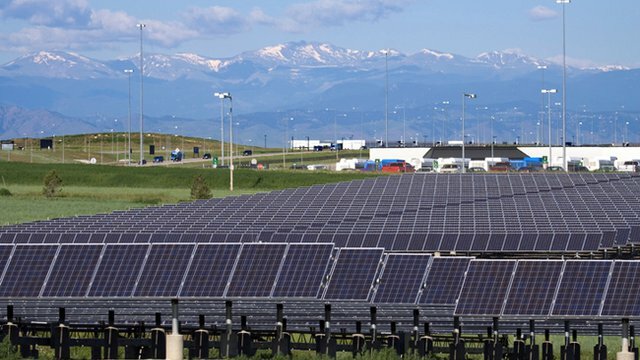 Denver International features the largest solar power farm at a commercial airport in the U.S., with four on-airport solar arrays generating enough electricity to power 2,500 homes. The airport’s pioneering environmental management system has led to numerous successes. In 2015, it diverted more than 2,100 tons of municipal solid waste from landfill. Across the airport’s operations, more than 200 tons of organic waste are composted annually, and plentiful stations for refilling water bottles are littered throughout its terminals. Denver’s passenger gates offer plug-in energy sources to aircraft, allowing them to shut down their auxiliary power units to improve air quality and reduce noise pollution. India’s largest international airport features the eighth largest terminal in the world. The airport’s 5.4 million foot Terminal 3 offers well-lit departure lounges, 1,200 low-power LCD screens, 300 rainwater harvesting stations, and storm drains to combat erosion. Battery-powered vehicles are used to transfer passengers between terminals and baggage claim. Indira Gandhi Airport recently won two gongs for its eco-friendliness, including the Wings India Award for the Most Sustainable and Green Airport, in addition to being declared the world’s best airport with more than 40 million passengers per year by ACI.